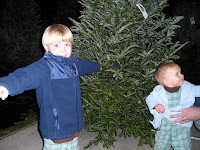 Every year, like many other families, we go on our mission to find the perfect tree. We don't go to one place in particular, we just go where it feels right. We get hot chocolate and coffee to keep us warm on our hunt. 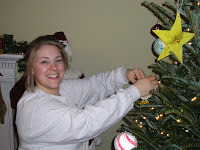 A cheesy tradition, but every year since we got married I've taken a picture of Shannon bringing our tree into the house. I don't know why, but it is so exciting for me. I am also that person who gets sad when we haul it out. There's a method to the madness! Not really, but it kinda worked out that way this year. We had the BEST time decorating this year. 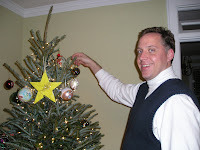 We laughed so hard and suffered many ornament casualties because Fulton was WAY too into decorating!!! 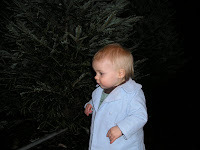 We contemplated putting the tree in the play pen or decorating it half-way up. 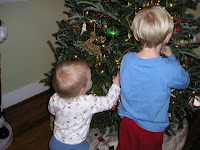 We ultimately decided to put the least important or breakable ornaments at the bottom. He is much more interested than Sam ever was. 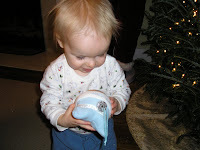 He must have said OOOOOO and uh-oh a hundred times as he discovered then pulled every ornament from the tree. 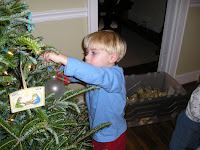 Sam was very careful and precise about where and how he hung each one on the tree. He refused any help offered and I was told "no, mommy! I am a big boy and I can do this myself, now." I loved having them so involved this year. It was very special!